Is it possible to work in the oil industry and be an advocate for both your work and for the environment? How can you be both loyal to your company and keep up a good relationship with the surrounding communities and environment? As a farmer, who depends on clean air and water for your livelihood, how do you fight against big oil companies and governments who are enjoying economic growth? 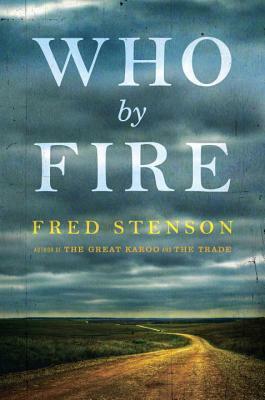 Who By Fire explores these questions and conflicts felt by the people who live and work in and around gas plants and oil fields. This story goes back and forth between a 1960s farming family living right next to a newly built gas plant and the present day middle-aged children of that same family. How have their lives been affected by the presence of the gas plant? Would their lives have turned out differently if it hadn’t come? He thought too… of all the people, animals, and things whose fate it is to be born too close to the fire. The shaking house, the creatures born dying, the rivers running discoloured to the sea. What kept my attention while reading this book was the changing family dynamics throughout the story; how they were different before and after the plant came, and how they changed as time went on right up until the present with Bill and his sisters still trying to make sense of their past. … there was a feeling of well-being between them. This was what it had been like, Tom remembered, before the plant came. They had been living with the plant for so short a time but it had changed everything. Love didn’t happen because a man was smart, strong, or handsome; it was simply there, like this sunny day. It had taken the last year of her marriage to learn that the opposite could also be true. When love was gone, it was also like weather. Endless cloud; occasional storm. The book provides a lot of detail about gas plants, how they work, the repairs they need, and the kinds of workers they need to run them. I learned a lot about the oil industry in Alberta, past and present. There was some talk about law suits that wasn’t really my thing, but may be of interest to others. Although, for the most part, the writing was good, there were a few sections where the dialogue seemed forced instead of effortless. Overall, though, I enjoyed this book and found the subject interesting. I am happy to have read it, as I haven’t read many books like it. I loved the industrial/environmental conflict. Stenson did a good job showing both sides of the equation; that the controversy is not black and white. If you are interested in the oil industry or the environment, as well as a good story, this would be a good choice for you. Industry-community relations have always had an adversarial side, but it was not for lack of determination by individuals inside the industry to improve things like sulphur recovery from sour gas. That said, the petroleum industry is in a destructive phase now, and governments have never been more averse to doing an honest job of regulation. What are your thoughts and experiences with the oil industry? How far is too far? Ooh, I was very curious about this book. I’m originally from Alberta and the firm I work for has many clients in the energy industry. I like that this book provides a very personal, human side to the story and controversy. You would probably like this book, then. It think the author has always lived in Alberta, and even though I have never been, the setting of the book feels very genuine. I would be curious to know what an Albertan thinks of it. This sounds like a really intriguing and relevant read. I imagine it’s difficult to balance the family dynamics with the more technical side of the oil and gas industry but it sounds like Stenson does an admirable job! Yes, I love the timeliness of Who By Fire. I really was impressed with his ability to turn a controversial topic into a good story. I am both proud and jealous of your current read. My library doesn’t have that book yet. I don’t know if they are just behind or if they will never order it. I hear it is good, though. I hope you like it! If you don’t like it, try The Confabulist before giving up on CanLit! For me, too. Which is why I learned quite a lot from this book. Someone else who already knows a lot about it might not, though. And, unfortunately, there were no solutions given (I wasn’t expecting that there would be); just awareness of the issues, and a lot of food for thought. That does sound interesting. You could compare them! I wonder which you would find more enjoyable to read.